The period from 1925-1955 has been considered the golden age of traditional Near Eastern and North African music. Both regions enjoyed artistic creativity and innovation, particularly in centers like Cairo, Damascus and Tunis. 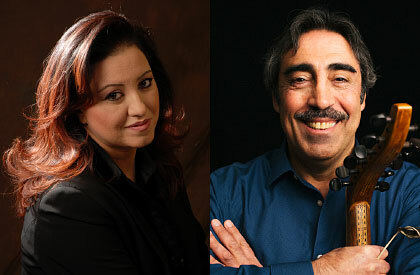 In this fascinating program, classical vocal and instrumental works from the Egyptian, Syrian, Andalusian and Tunisian repertoires, as well as original pieces, will be performed by two leading artists in the Arab world. Featured are the internationally renowned Tunisian singer Sonia M'barek, who has been noted for her exquisite and soul-piercing vocals, and ‘ud (lute) and violin master Simon Shaheen, one of the most influential Arab musicians, educators, and composers of his generation. They will be joined by Shaheen’s acclaimed Qantara ensemble composed of Bassam Saba (nay – reed end-blown flute, Western flute), Layth Siddiq (violin), and Tareq Rantisi (hand percussion).